Shabbychick Junk. : Don't try the cake, go for the icing. 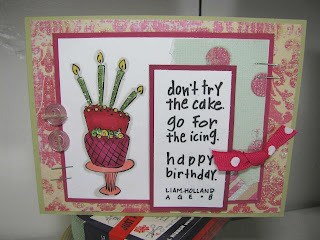 I revived this old Stampin Up "Sweet Treats" birthday cake stamp because I needed to crank out birthday cards again. I HAD to use my Michael's coupon to grab this Inkadinkado kids sentiment "Don't try the cake, go for the icing" sentiment. 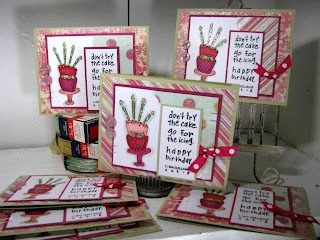 I am finally seeing these cute sentiments in stores now; I fell in love with them at the Anaheim CHA show last year! I paired the cake up with some pink "My Mind's Eye glittery Laundry Line papers (Flirty Embrace, Flirty Stripes & Flirty Fun Lovin". The papers are super glittery and shimmery, so you don't have to use glitter on them! No mess! These came together quickly at a girls get-together that I went to last weekend. I'm still in use-it-up mode, I used almost all of this hot pink May Arts polka dot ribbon that's been in my stash for AGES! I love when I use stuff up! Today I'm heading out to my hometown for a Christmas tour of homes. I have my tree up and ready to decorate because I always get the bug to haul out my decorations after seeing all the cool decor at the home tour houses! Happy Sunday, all! Also, love the sentiment......going to have to keep my eyes peeled for that one!!! !